Don’t miss “Iowa’s Ancient Trails” by Iowa State Archaeologist Educator, Cherie Haury-Artz. 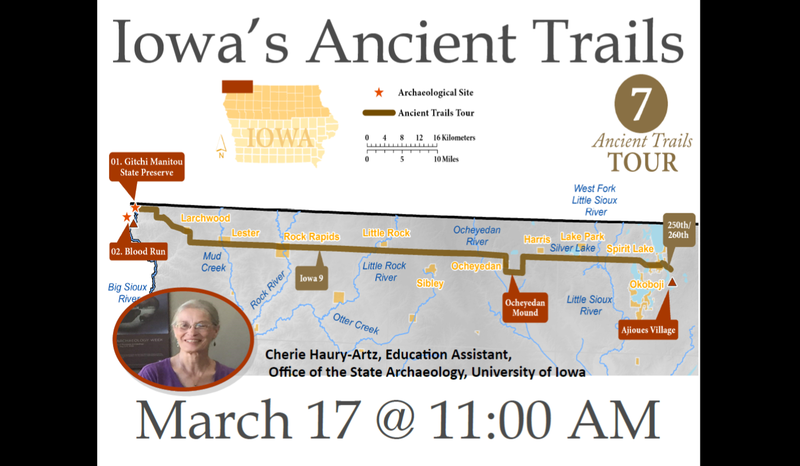 Haury-Artz will present researched information on 8 of Iowa’s ancient trails that people can drive/bike along. The presentation highlights the trails geology, history, and prehistory of each route, focusing on landmarks or places to visit along the way. She will focus on the Spirit Lake to Blood Run Trail that cuts west from Spirit Lake to the Gitchi Manitou State Preserve.